Photoshop lets you bring in images from just about anywhere. You can acquire images from cellphones, iPhones, iPods, iPads, and a variety of different handheld devices. As a matter of fact, you can do quite a bit with uploading, downloading, and preparing photos for handheld devices. If you want to add images from a cellphone to the Organizer or open images in one of the editing modes, you need to copy files to your hard drive via a USB or Bluetooth connection or download an email attachment of the photos if your phone can use email. Choose File → Get Photos and Video → From Files and Folders. 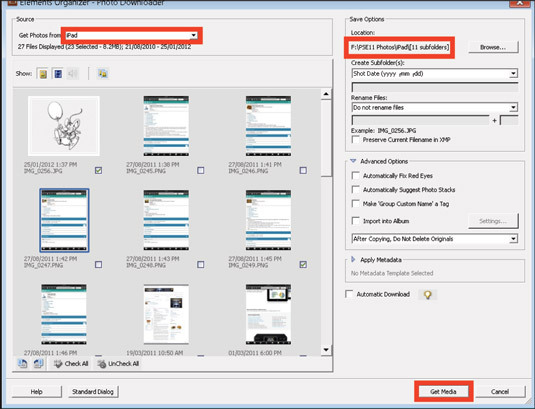 The Elements Organizer – Photo Downloader dialog box opens. Locate the folder into which you copied the files and add them to your Organizer. Or you can open them in one of the editing modes. With an iPhone, iPod touch, or iPad, you can use the Photo Downloader to transfer media. Hook up the device with a USB cable. The Photo Downloader opens automatically. Click the Browse button to open the Select Directory to Store Files window and select a destination folder. Click the Select Folder Button to identify where the photos are saved. Click the Get Media button to download the photos to your computer. Hook up an iPhone or iPad via a USB cable to your computer and choose File –> Get Photos and Videos –> From Camera or Card Reader. For iPhone, iPod touch, and iPad, you can also hook up your device via a USB cable and choose File → Get Photos and Videos → From Camera or Card Reader. Elements recognizes the device, and the Photo Downloader opens, giving you options for importing all photos or selected images. In iTunes, choose File → Add Files to Library. Select the images and videos from a folder on your hard drive that you want to upload to the device. When uploading photos to an iPhone or iPad, use only the formats these devices support, such as JPEG, TIFF, GIF, and PNG. Hook up the iPhone or iPad and then click the Photos and/or Videos tab at the top of the iTunes window. Select the check box for each item you want to upload and then click the Sync button. You can bypass iTunes with the iPad by using the Camera Connection Kit (older iPads) or the Lightning Adapter (newer iPads), provided by Apple for $29.95. The kit supports only SD cards, but you can attach many different types of card readers to the USB port on the Camera Connection Kit and use other media cards. Copy files from the Organizer to the media card and use it as you would use an external media source to share photos back and forth between your computer and the iPad.